Although they’ve been around since the ’60s, ultraviolet lights show no signs of fading away; in fact, they just keep adapting to the times. Now ADJ has created the ultimate “black light” for today’s mobility-charged culture. 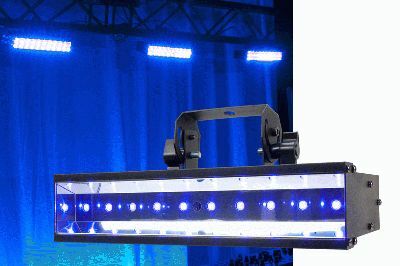 The company’s new LED UV GO is an LED-powered ultraviolet bar that can GO just about anywhere, because it runs on its own internal lithium battery and doesn’t require a power cord. Featuring a 10° vertical x 40° horizontal linear beam angle, the LED UV GO is perfect for wall washing and uplighting. Its 10 x 1-watt UV LEDs produce an impressively bright ultraviolet wash, and users can add effects such as a variable Strobe and 0-100% Electronic Dimming. Part of ADJ’s popular and expanding battery-powered GO Series, the LED UV GO is ideal for venues and events where there are no convenient electrical outlets to plug into. Mobile entertainers and lighting designers can simply set up this lightweight cordless unit wherever they choose, unhampered by the restrictions of power, and create instant glowing black light effects. With no electrical hook-ups to worry about, the LED UV GO gives designers total freedom to achieve their creative vision. The LED UV GO can cast its ultraviolet aura for an entire evening or performance, since its built-in lithium battery can hold a charge for up to 8 hours (full on). No worries about suddenly running out of juice either -- a Battery Life Indicator on the rear panel clearly displays the amount of battery charge that remains. The battery itself can be easily recharged up to full throttle in 6 hours (recharging cord is included). Users also have mobility when it comes to operating the LED UV GO. The unit comes with an ADJ-RC1 infrared wireless remote controller that provides cordless command of its built-in functions – including Strobing, Dimming and Blackout -- from distances up to 30 feet away. As another control option, these functions can also be accessed via a convenient 4-button LED display (non-DMX) on the unit’s rear panel. The LED UV GO’s solid-state LEDs represent another big leap forward compared to the lamps used in “hippie era” black lights. Much more energy-efficient and maintenance-free, its LEDs draw only 53 watts of electricity and are rated to have a 50,000-hour operating life. Plus, with no moving parts, the LED UV GO is much more likely to operate reliably over long periods of time than its predecessors. Designed for easy portability, the LED UV GO measures 12.5”L x 7”W x 5.5”H/ 317 x 172 x 136 mm, and weighs just 6 lbs./ 2.5 kg. Its MSRP is $419.95.